I'm not saying that blogs are like buses - but you wait for ages and then two come at once! I've had rather a nice day, beer was involved later as well, so in fact the best evening I've spent with the OH for some time. When the Barnsley War Memorials Project began to gather steam earlier this year I made contact with Janet Dyson from Penistone. She is part of the Penistone History Group and she told me that they were planning to continue the work started by Richard Weller on the names on the Penistone War Memorial. Tonight that work came to fruition with the launch of their new book "The Stories Behind the Names". It's a sizable book, A4 and 192 pages plus a heavy glossy card cover. Spiral bound as you can see, which is an advantage as it allows you to lie the book open and flat very easily. Price £10 and available from the Penistone History Group who meet on Wednesday afternoons and Thursday mornings at St John's Community Centre in Penistone. Each of the 58 names on the memorial has been researched plus another seven names of men who might or should have qualified for inclusion. Each man has two pages, one with a reproduction of his Commonwealth War Graves certificate and facing that (which is why it is so handy the book lies flat) is a page with family, personal and related military information for the man. There are quotes from the local newspaper, the Penistone Express, from the Penistone Almanack and from Army Service records. In their Foreword Janet and Rex Dyson comment that, "One of the most surprising and poignant details we came across is that the memorial shows five pairs of brothers, all killed." 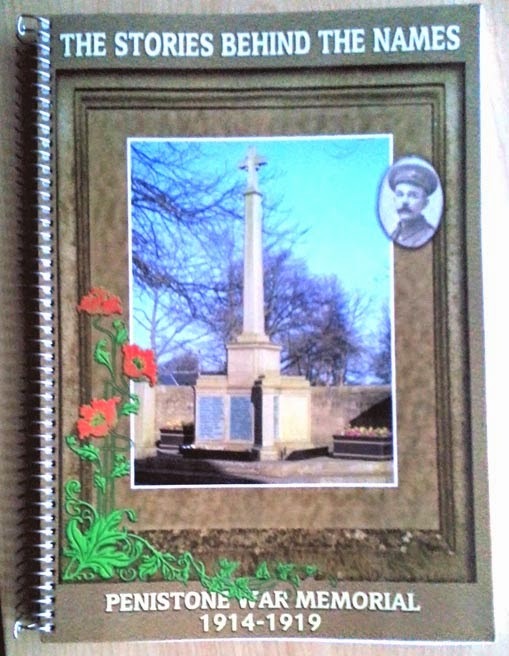 The book also contains a brief history of the war as it affected Penistone in 1914, contemporary pictures of the dedication ceremony for the memorial in 1924, information about Penistone and district men who were given awards for bravery and a section on letters and news from overseas throughout the war. At the end of the book are two pages of references and acknowledgements. I was immensely pleased to see that the Barnsley War Memorials Project had been included under websites in resources list. The launch this evening (Wednesday 16 July 2014) was well attended and a very enjoyable occasion. Afterwards the OH took me down the road to visit the Penistone Royal British Legion Club where Barnsley CAMRA had photographed three Rolls of Honour for the BWMP a month or so ago. They and their surrounding display of medals were even more awesome in real life. The OH even managed to take some extra photos while we were out, of the Lady Chapel in St John's Church, of the WW1 Roll of Honour in the RBL club and of Hoyle Mill War Memorial on the way home which has had its urn replaced in the last couple of days, much to my surprise.